As the Centre is losing 20% of its representation with the axing of Greatorex, the town council should take up the slack in the region’s diminished democratic system. That’s the view of Jason Quin (pictured), one of the seven candidates for Saturday’s council by-election. 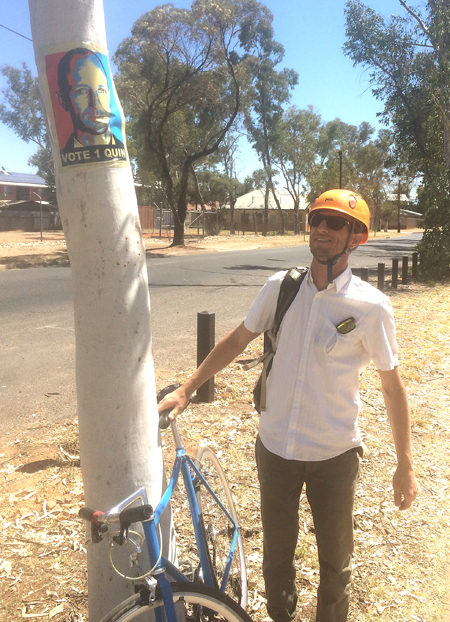 Revival of The Alice as a solar city, promoting the town as a Mecca for cycling and iconic events, and encouraging the “bush ingenuity” of locals will also be on Mr Quin’s agenda if he gets in. He says he’s lived in The Centre “a few times” but this time ’round he’s been here for five years. He worked for the Centre for Appropriate Technology (CAT) for three years, after which he was appointed executive director for the past two annual Beanie Festivals. He has a son aged five who goes to Steiner School and “I try to be as involved with the school as I can be”. Mr Quin’s mother lives in town, so does a sister and a cousin and their families. Chairing Red Hot Arts, which runs the Alice Desert Festival, as well as the Alice Springs Art Foundation which runs the Alice Prize, and being a member of the Tamara Co-operative that runs the date farm on the road to St Teresa takes care of much of his time. Mr Quin says the council has a “pivotal role in the health of our community”. Through the projects and organisations he’s been involved with he has had a lot of interaction with the council, with elected members as well as staff. “Local government can play a leadership role beyond roads, rates and rubbish and it does,” he says. QUIN: The councillors are representatives of our community and the public has elected these people to provide leadership. There is a clear mission for council to support community development and community cohesion, and how it might shape the future of our community. NEWS: What kinds of things is the council doing, or should be doing, in the next few months? QUIN: The council is involved in lots of events. It can make sure they are run smoothly, supporting small organisations. Council has an opportunity of participating in town planning. Responsibility for the built environment in many cases falls to the council. NEWS: Should town planning be a council responsibility, rather than a government one? QUIN: We should constantly consider where responsibilities lie in the three tiers of government. NEWS: So, should council have planning powers? QUIN: Alice Springs is far from Darwin and far from Canberra. I would support greater responsibilities for council, especially in an area such as Central Australia. I would like to see more planning powers for the council. Mr Quin qualifies his remarks by saying the costs of any new council functions, and resulting increases in rates, would always need to be a consideration. NEWS: Is the council a lobby for the town? Should there be a chain of communication such as from the public to the council to the government? QUIN: I believe in participatory democracy. Anything we can do to increase people’s participation in governance can only improve it. Yes, council must play a leadership role. I believe it does but it can always do more. NEWS: Does that suggest that if the council puts something to the government, the government would be wise to listen and comply? QUIN: If the council, as a representative body, is ignored by the government, then you would question whether the system was working. NEWS: What would you like the council to say to the government right now? QUIN: Alice Springs has shown it can be a leader in solar technology. We are winning awards. Solar City 2.0 should be high on the agenda. That project demonstrated great partnerships and that scale of collaboration is what is absolutely necessary. We should increase our recycling capacity, looking at green waste, at models for composting, enticing entrepreneurs to see them as market opportunities. The energy question is critical. The council is showing great leadership by investing in solar, showing that’s the way forward. NEWS: Any other fields of endeavour? QUIN: I see great value in cycling as a pastime and displacing motor driven transport. We already have great bike paths. We can improve that, improve access into the CBD. Cycling and mountain biking events offer great tourism opportunities, exploring our wonderful landscape by bicycle. NEWS: Are there any big-picture issues, over the next 20 or 30 years? QUIN: Alice Springs already has an amazing tradition of bush ingenuity. The first time I came to Alice Springs we met and stayed with Kurt Johannsen [the inventor of the road train]. He’s a real Alice Springs hero. When I lived in Mintubi, the opal town, I remember him visiting in his wood fired car. A lot of people in Alice are similarly motivated. We should enable them to be entrepreneurial. There is infrastructure the council can provide. I’ve seen and studied these models in other jurisdictions, and I’d love to champion that, space where people can start off small, experiment. I’m involved in the date farm, putting my hand to sustainable agriculture and business models. Increasing self-sufficiency is absolutely essential to our future. NEWS: Would you use your seat on council as a springboard to a seat in the Legislative Assembly? QUIN: No. Local government here is more important than elsewhere. Given the almost island-like position of Alice Springs, it’s important to develop the region, and I favour the collegiate system of the council to get things done. NEWS: Is it your view that the council, with nine locally elected members, can do more for Alice Springs than four MLAs, some or all of whom may not be in government? QUIN: The recent loss of an Assembly seat here demonstrates that representation by MLAs is reduced. Darwin’s population will grow much faster than here. That representative model is going to continue to weigh against us. QUIN: Definitely not. In conversation with other candidates I am disappointed to have found concealed alignments. I don’t want to say any more about that. NEWS: Where do you stand on fracking, and what should the council be doing? The Katherine Council is pushing for a moratorium. QUIN: I have spoken to the Mayor and councillors and I can see there is some very strategic diplomacy going on. That gets to the heart of whether the council is participating or is a sideline entity. NEWS: So, are you against fracking or for it? QUIN: I am not for fracking. On the information we have the risks are too high. The Hawke review suggested we need robust processes and there have not been any changes to the current processes, so far as I know. NEWS: How do you gauge the affiliations in the current council? Are there blocks? QUIN: There is a majority of councillors who share views. QUIN: I think the majority is conservative. There is definitely room for fresh ideas and more balance. That’s also why I am running. I’m careful not to be partisan. I don’t believe in right and left. That’s outdated. There are people in council whose views I may not share but I am often illuminated by their perspectives. NEWS: Which of the current councillors would you be most comfortable working with? QUIN: I have an excellent relationship with Mayor Damien Ryan. I was part of the business innovation committee that Damien was also on. WiFi for the Mall and pop-up shops came out of that. I found Damien to be a highly adaptive and intelligent leader. Brendan Heenan is a great representative of the tourism sector and a great supporter of community organisations. I’ve sat on committees with Jade Kudrenko and really liked working with her. I’ve had good contact with Chansey Paech. I’ve had less contact with other councillors. NEWS: Does the council have strong links with the town’s big lobbies – Chamber of Commerce, Tourism CA, Congress and ALEC, and do they collaborate as a group that represents the town? QUIN: Yes, I think so. There is a growing progressive community, to borrow a word from American politics. Part of that is dissatisfaction with Territory and Federal politics. Part of it is the importance of the knowledge economy, and of the arts. There are many people in those sectors who have progressive political views and from what I’m hearing, not all of them feel represented at the level of council. I’ve served on boards with Kay Eade of the Chamber and Jaclyn Thorne of Tourism CA. They are also great leaders in the community. I found them to be very accepting of my views and both have expressed support for my campaign.